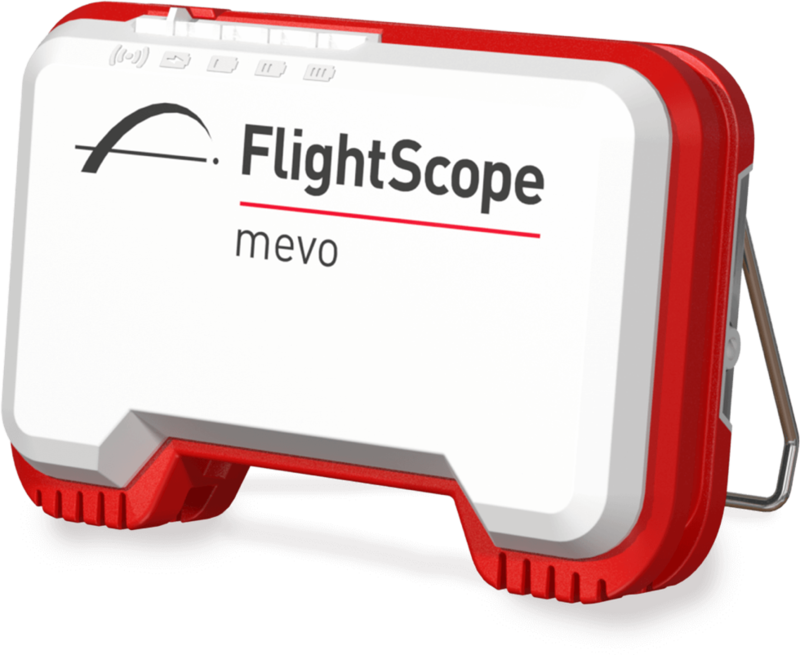 The FlightScope Mevo is lightweight, and small. I’d seen a few pictures, and read a few comments, and I still had a hard time believing how small the thing was when I took it out of the box. It weighs in at 0.4375 pounds, and measures a paltry 3.55″ x 2.76″ x 1.18″. You can fit one in a golf hole, your pocket, the valuables pouch on your golf bag, or your golf cart’s cup holders. It’s tiny!!! The Mevo’s got a little kickstand! And, below, a tripod stand. The Mevo connects to your smart phone (tablet apps are coming soon) via Bluetooth 4.0, and charges via a short USB-A to USB Mini cable. A full charge from empty takes two hours, according to FlightScope, and the battery lasts “up to four hours.” In practice we found this number to be pretty accurate. 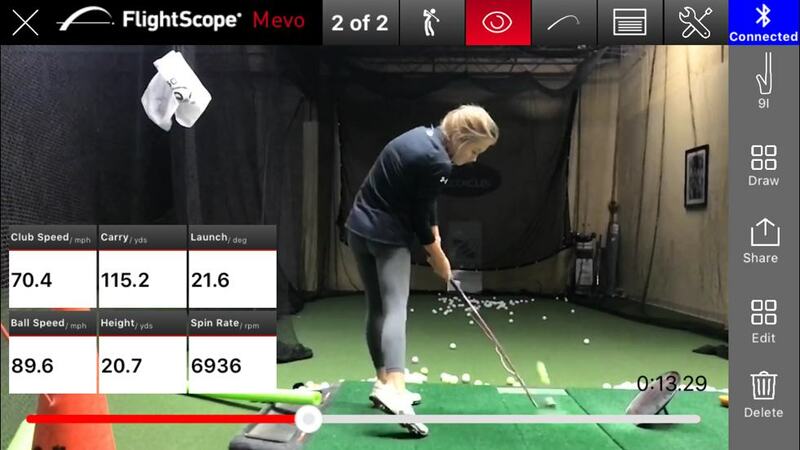 For indoor use, FlightScope Mevo requires eight (8) feet of ball flight, with four to seven (4-7) feet behind the ball for the Mevo itself (for a minimum of 12′ of space). Included metallic stickers are recommended for measuring spin accurately, particularly indoors. Mevo uses a 3D Doppler radar that’s a simplified version of those available on FlightScope’s other models (the Xi Tour, the X3, etc.). Those launch monitors employ a more sophisticated 3D Doppler tracking radars with phased array technology. 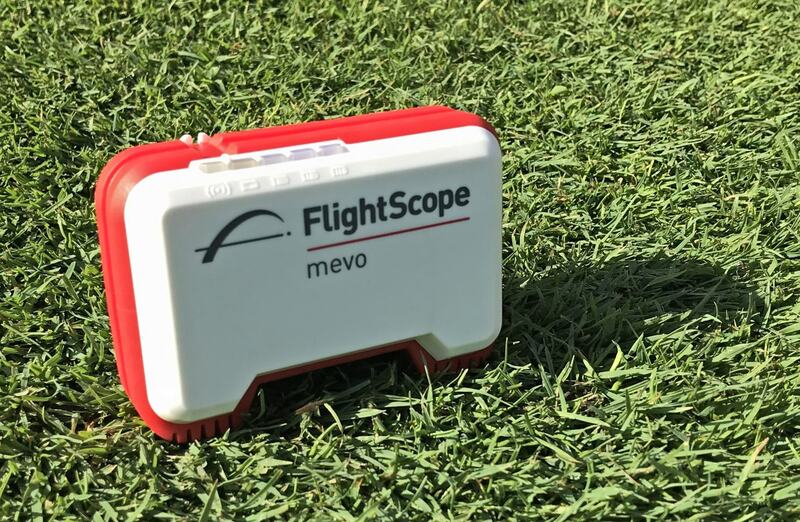 Though Mevo isn’t quite as powerful as the FlightScope solutions that cost 10-25x as much, FlightScope says it is the most accurate launch monitor of its kind. Mevo can track shots as short as a few yards, and has a special “Chipping” mode intended to track shots under 20 yards. Other modes include an “Indoor” mode for shots that will travel a maximum of 40 yards, and of course an Outdoor mode for shots that will land uninterrupted. 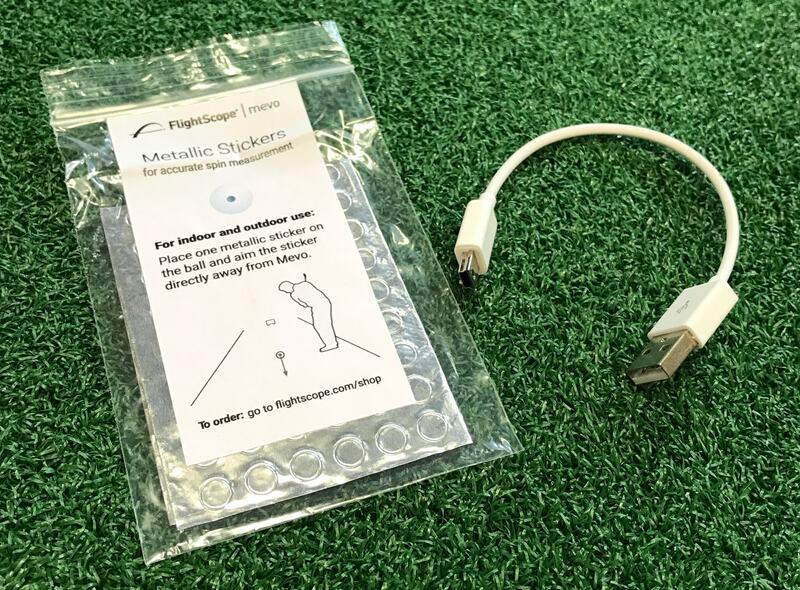 Looking to dial in your short game distances? Mevo can help. 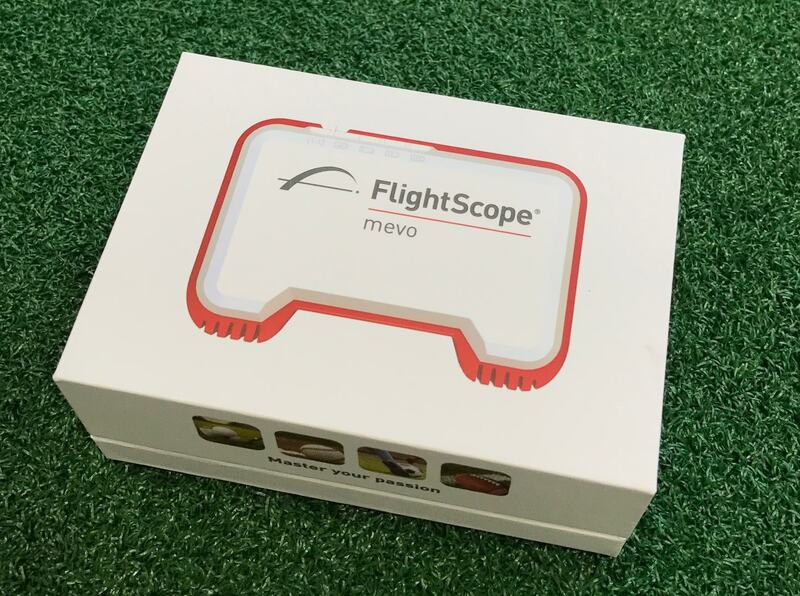 FlightScope promises that a Combine feature is coming soon, and the Mevo software requires iOS 10 or later, and a similar version of Android. 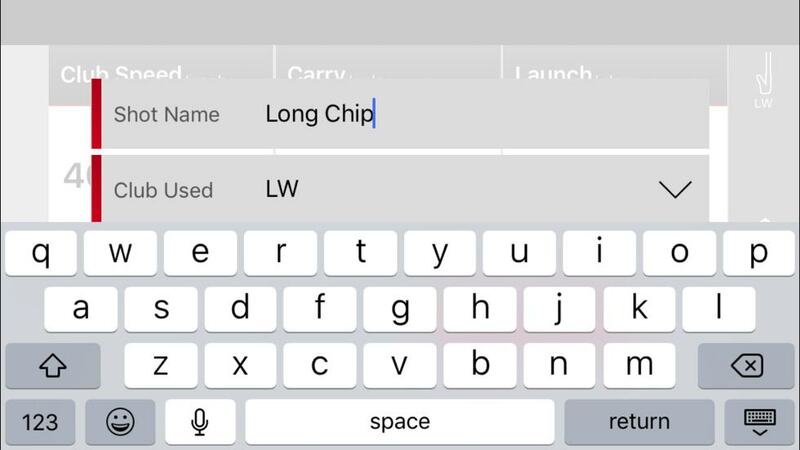 This video provides a nice overview of the initial setup, and offers a peak at the app in its initial release state (they’ve added and updated the app quite a bit — note the missing “Chipping” setting, among other things). In practice it really is that easy to set up and use. You slide the Mevo out of its pouch, press a button to turn it on, launch the app, and in under 30 seconds, you’re hitting balls and measuring your performance. Seen here, the Mevo app lets you determine how much video you want to record and at what framerate, which data it should speak (if any), and more. 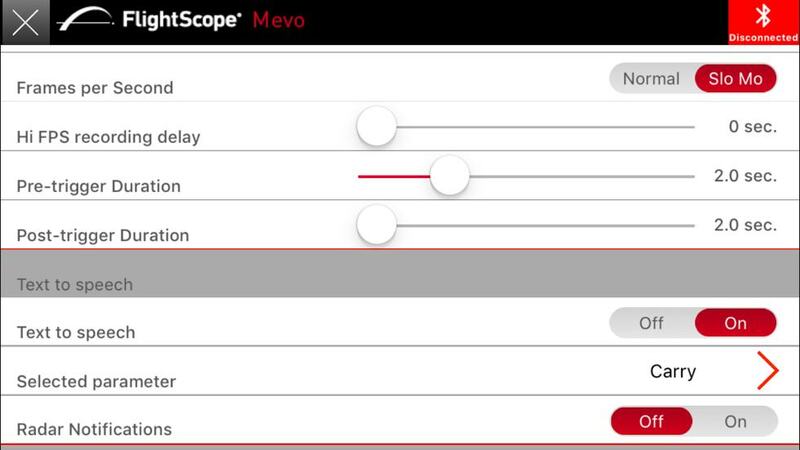 The Mevo settings screen offers a good number of configurations without providing so many that it’s needlessly cumbersome. You can control everything you’d want to control and a few things you might not have considered: change from Imperial to metric, select whether your phone’s front-facing or rear-facing camera should record video, choose which data point to speak aloud, set your current altitude for accurate distance, and more. One of the settings you’ll want to configure first is the data display (the “grid”). As you can see below, you can choose between displays of one to six data points, and by dragging the data object from the list on the right, can determine where the data is displayed. Since you have the option to have the app use speech-to-text to read aloud a data point, you can actually see or hear seven of the eight data points per shot. If you wish to keep things simple, you can choose the 1-up or 2-up display to show only the most relevant data for that particular application. For example, if you’re working on generating swing speed, perhaps that’s all you want to see, but if you’re fine-tuning your wedges, perhaps the spin rate, carry, and launch angle are all important enough to display. The Mevo app lets you see anywhere from 1 to six data points at a time. That’s what Mark, one of my college players, said upon seeing the Mevo for the first time. I have to admit… I was right there with him. I’ve bought packs of gum bigger than the Mevo, and at less than the cost a year-old iPhone, I was skeptical that this small package could pack a powerful, accurate punch. Like so many times in my life, I was happy to be wrong. And oh how wrong I was. The software on Android could use a few tweaks to make the numbers larger. I shouldn’t be surprised. Years ago at Golf Evolution Dave Wedzik and I tested the FlightScope against a Trackman with a 12,000 FPS Phantom camera. In short, the FlightScope was way more accurate and consistent at correctly measuring the AoA, launch angles, etc. than the twice-the-price Trackman. 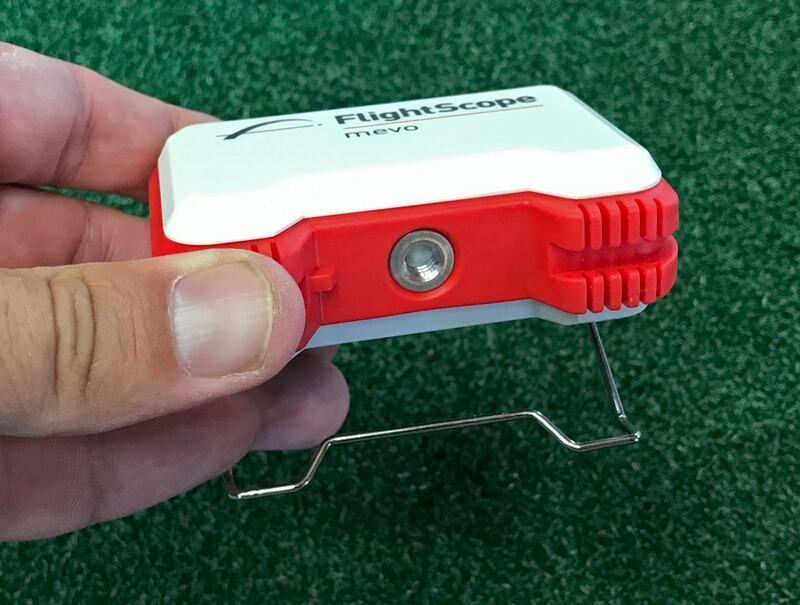 We’ve been on the FlightScope bandwagon ever since. I first tested the Mevo indoors with a friend. We had plenty of premium golf balls with metallic stickers already affixed. For the first indoor tests, we put the Mevo only 4′ behind the golf ball. We didn’t have a secondary means of confirming any of the data: we simply hit shots with several clubs and looked to see if the launch angle, carry, and clubhead speed numbers seemed to match up. With a 6-iron, we consistently saw numbers that ranged from 173 yards to 188. The launch angles (15-18°), spin rates (5700-6100), and other data points seemed accurate, based on our games. We moved on to partial wedges, and again, the Mevo kept up. I’ve long marked my partial wedge yardages on the underside of my shaft, and the numbers matched up with what I was hitting. The Mevo was off to an impressive start. The next session was outdoors, with Mark from my college team, and we started this session with the club that, for lack of time, we hadn’t hit indoors: the driver. I again placed the Mevo 4′ behind the ball. Mark hit some drivers, and they registered some odd numbers: carries of 255-275 (pretty typical for him) with clubhead speeds of about 115-118 MPH. Smash factors ranged from 1.31 to 1.38… or not very good. Mark insisted that he was hitting the ball pretty solidly, and we confirmed with a few Sharpie-marked balls. I was pretty sure that Mark doesn’t swing at 118 MPH, so if the Mevo was misreading his clubhead speed, that would throw off the Smash factor. I moved the Mevo back to 7′, and it immediately began recording accurate clubhead speed numbers. Correspondingly, Mark’s smash factor jumped up to 1.45+ as his swing speed “dropped” to 105 MPH territory. 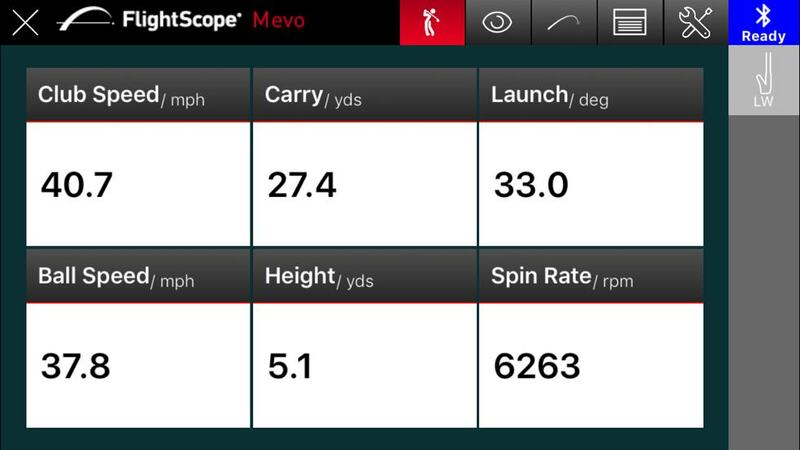 With the wider arc of the driver, it’s understandable that the Mevo had a hard time getting enough samples from the driver to accurately measure the clubhead speed from only four feet. The driver clubhead was likely not in “view” of the Mevo for very long at all from that close range. After moving the Mevo back to 7′, the driver numbers began to make a lot more sense. And yes, Mark caught this one a bit high on the toe (1.52 is not uncommon for such a shot). Twenty drivers later, I was impressed with the Mevo once again. It nailed every shot, save one: a bad heel-pull that “disappeared” behind Mark, obstructing the ball from the Mevo. Predictably, the Mevo didn’t give any data on that shot (nor could it). Launch angles seemed accurate. Carry yardages seemed accurate. Spin, clubhead speed, and ball speed were what we’d expect. It pegged everything, as far as we could tell. As you can tell, we have the Mevo speaking his carry yardage. Prior to this, I’d walked out on the range with my laser to verify these yardages. The range slopes downhill a bit, but once we estimated the level of the teeing area was about head height to me out on the range, the yardages the Mevo called out were all within a yard of what I measured with a laser. Early launch monitors from a certain Dutch company often had a hard time reading the ball flight when a player took a divot, necessitating many of the early adopters of those orange boxes to hit off a lie board. Here the Mevo impressed once again, as even the biggest divots Mark took did not seem to fluster the Mevo. It just kept spitting out seemingly accurate numbers, shot after shot. 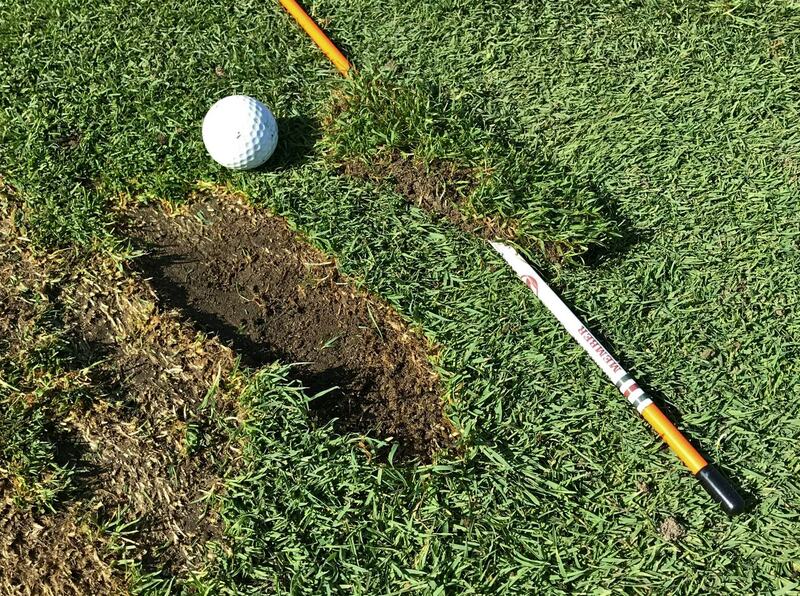 Mevo gives accurate results even when you take some BIG divots. In trying to test everything the Mevo was telling us, we next set out to test the “carry time” or “flight time” measurement. To check this, I recorded 240 FPS video and counted the frames from when the ball was hit to when it landed. 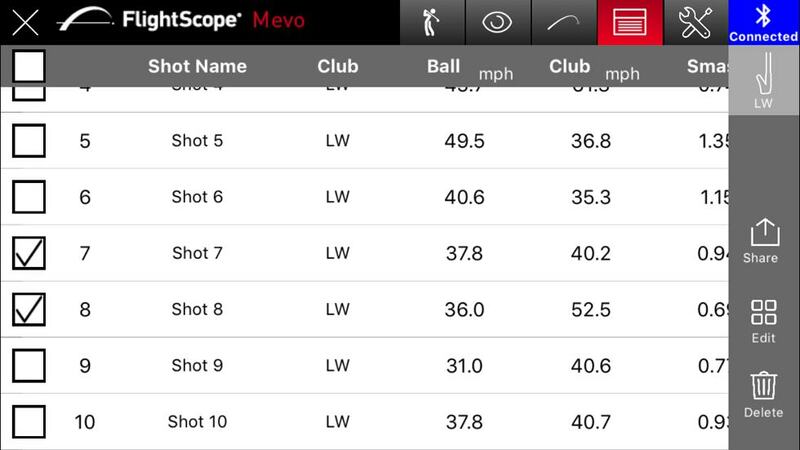 Over six such videos, with different clubs hit in each, the Mevo was accurate to within 0.1 seconds. Now, why you care about flight time I don’t know… but it’s there if you want it, and quite accurate. In testing this flight time, we noticed something right away: the flight time (or whatever data you had spoken) would get called out before the ball even landed. This meant the Mevo wasn’t truly measuring the entire ball flight — it was measuring the first x yards of ball flight and calculating the rest. 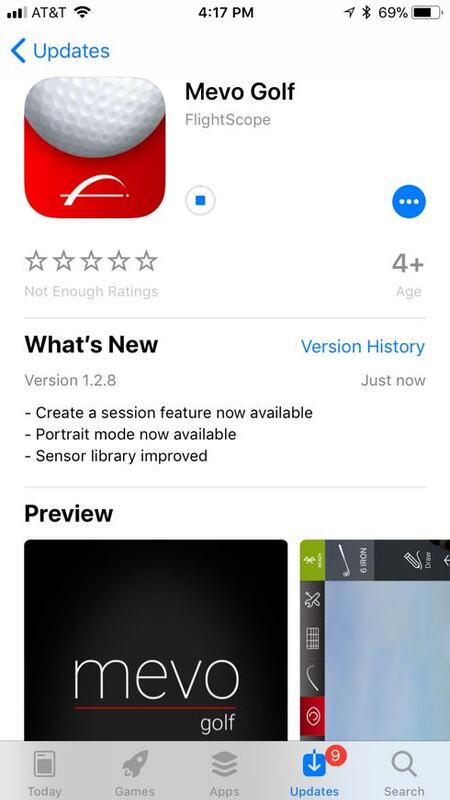 The Mevo firmware is updated often, and updates takes 10-15 minutes. 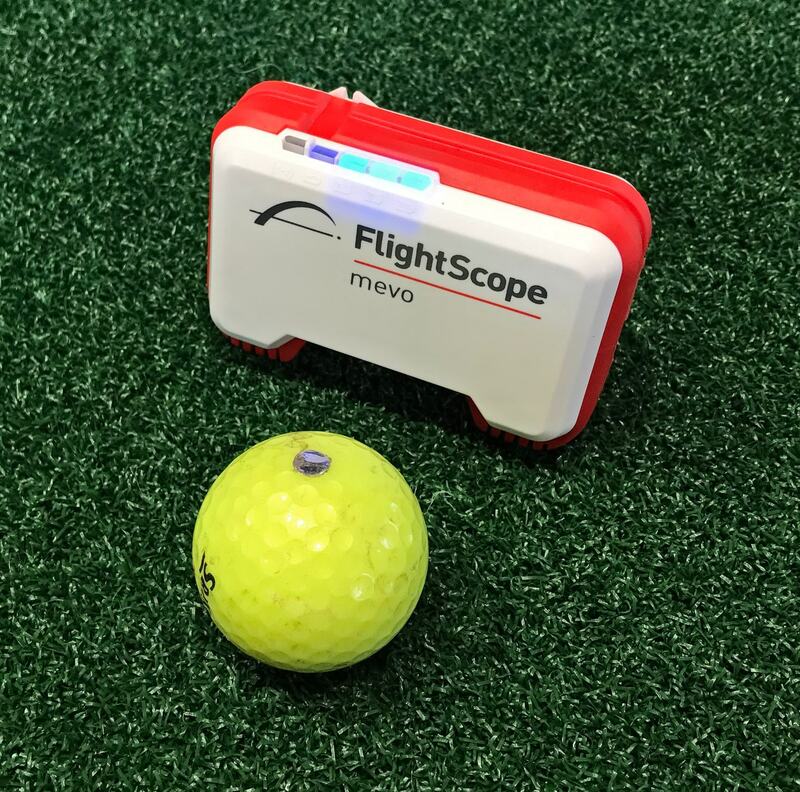 When I asked FlightScope how much of a ball’s flight the Mevo measures (whether in seconds or distance), the company was understandably vague. Short of measuring the entire flight, any answer they could give may lead people to assume it’s not as accurate as it turns out to be through extensive tests. At any rate, I continued testing with other golfers, using a mixture of the same “is that about how far you usually hit [club x]?” (we did not give this testing much weight! ), some laser measurements (both on the golf course and on the range), and lastly by comparing Mevo data against the Mevo’s much more expensive brethren, the FlightScope X2, Xi Tour, and X3. After setting up at 4′, we had better results moving the Mevo back to 7′, which is still really very close! Testing — both indoors and outdoors — with the metallic dots and a FlightScope X2, Xi Tour, and X3 — yielded results I would unabashedly call remarkable. Though the machines that cost about 20 times the Mevo’s cost performed a bit more consistently, the Mevo performed solidly and gave good data. Should you need to mount the Mevo on a tripod, it comes with a mount. Ball speed was among the most consistent data point, and it matched most closely. 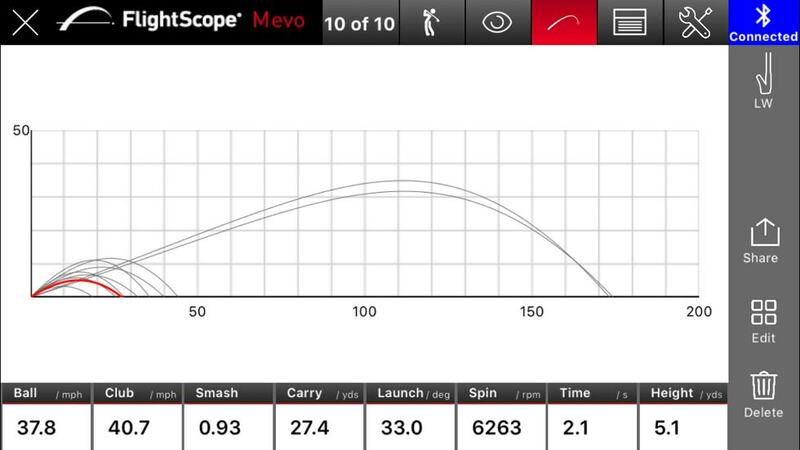 This makes sense as ball speed is, as I understand things, relatively easy to measure. It’s the most basic data point for a launch monitor. Club speed was a bit less consistent, though the Mevo never disagreed by more than 2.5 MPH. As you can imagine, Smash being a matter of division, was as accurate as both of the previous stats combined. Vertical launch angle was acceptably accurate. 90% of the numbers were within 0.7 degrees between the two machines, with a few outliers that pushed as high as 1.6° difference. These outliers were often on badly pulled or pushed shots, and perhaps the Mevo’s radar beam doesn’t spread quite as wide or quite as powerfully as the pricier FlightScope models. Carry distance, Height, and Time are calculated values, as far as I can tell, and thus they’re likely using the same algorithms as the big FlightScope machines. The Carry distance, height, and time were all within a percentage point or two, and varied in the ways you’d expect: when the Mevo read the ball speed as 1 MPH higher, the carry was a bit longer. Let me put those numbers into context a bit more, too, since I just spent two paragraphs talking about 0.7° here and 300 RPM there. This is incredibly impressive. I might have accepted a 10% error across the board if it was consistent. 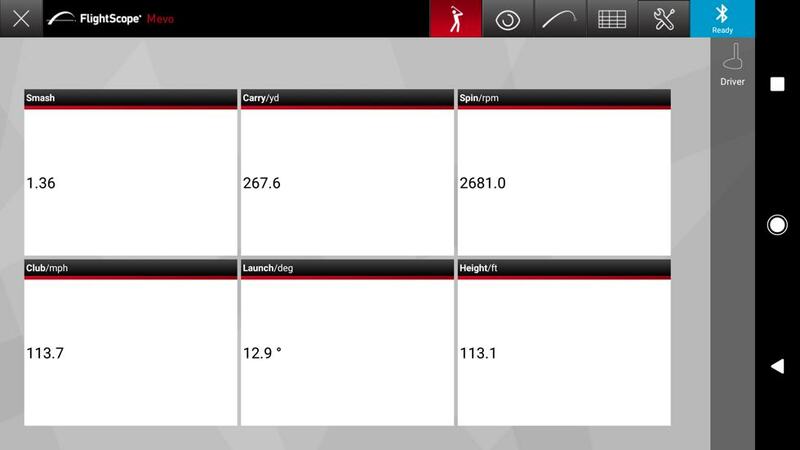 Consistent data, even if it’s not super accurate, at least allows you to compare changes in ball flight. But no, I got it all: I got the consistency I wanted with what I consider to be a superb margin of error. Now, it’s not all peaches and roses, of course. The Mevo doesn’t measure or calculate everything — it won’t track the Angle of Attack (AoA), the swing direction or path, the vertical swing plane (VSP), or horizontal launch angle (HLA). The 27-yard shot seen elsewhere, viewed in what I call the “trajectory” view. The last one of these makes sense. Honestly, though the Mevo comes with a little “sight notch,” you almost have to lie on the ground to use it. You’ll probably just end up doing what I did: eyeing it up and pointing the Mevo in the general direction of your target. In that sense, the horizontal launch angle is never going to be very accurate in a camera-less system. AoA, HSP, VSP, etc.? Well, again, this device costs $499. 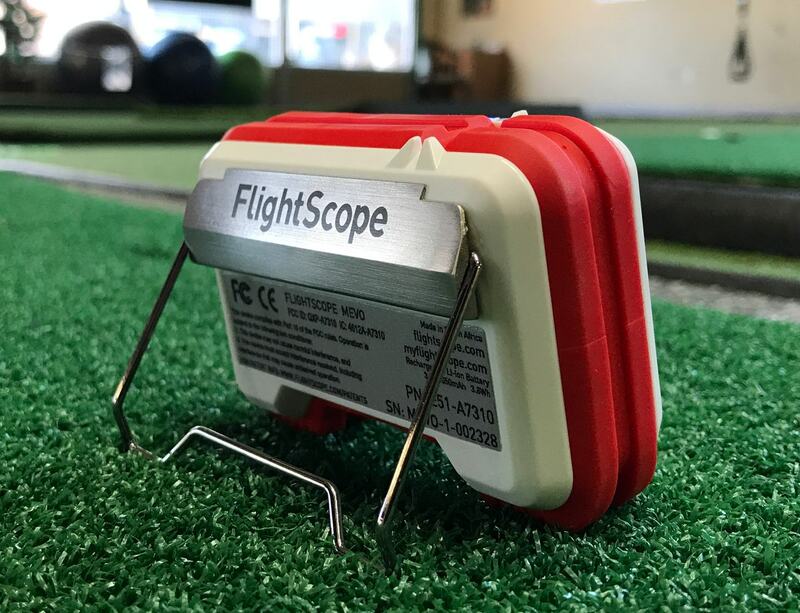 FlightScope isn’t going to be able to give you everything for that low cost. The final test: chipping and the short game, or shots under 40 yards. For shots between 10 and 40 yards, the Mevo continued to be accurate. For shots shorter than 10 yards, or really low shots (maybe you’re a big fan of chipping with a hybrid), the Mevo gave erratic data. A five-yard shot would sometimes say it went eight yards, and other times three yards. I don’t rate this as a negative — you shouldn’t really need to know the exact yardage of your sub-ten-yard shots. One thing about recording indoors… the Mevo can be sensitive to differences in height between the Mevo and the ball, particularly if the ball is on a mat 2-3″ above the Mevo. Perhaps this is simply because the Mevo can’t “see” the exact moment of impact, and the corner of the mat blocks the Mevo’s radar partially. We noticed a clear trend of iffy data when we hit from close range with the Mevo well below the mat surface. Of course, if you teed the ball up for a driver, the difference in height did not seem to affect the data, and similarly, shots outside on upslopes or downslopes didn’t seem to be affected. If you’re on a range with elevated mats, just prop the Mevo up to get it to about the same height as the mat. As you likely saw in the videos up above, the Mevo software is easy to use. Connecting is a breeze, and the data is displayed in a grid you’ve chosen. Two basic modes are available: video and data. In data mode, the rectangles of data in the grid simply fill with information when it’s measured or calculated. You keep hitting shots, the data keeps recording. You can edit at the end, deleting shots, renaming shots, saving or deleting an entire session, whatever you want. Video mode automatically records and plays back video with data overlaid. I did not use the Mevo extensively with my FocusBand. It connected, and appeared to work. The Mevo software lets you name shots and change clubs. The Mevo app stores data and videos on any available memory on the smartphone (or tablet). 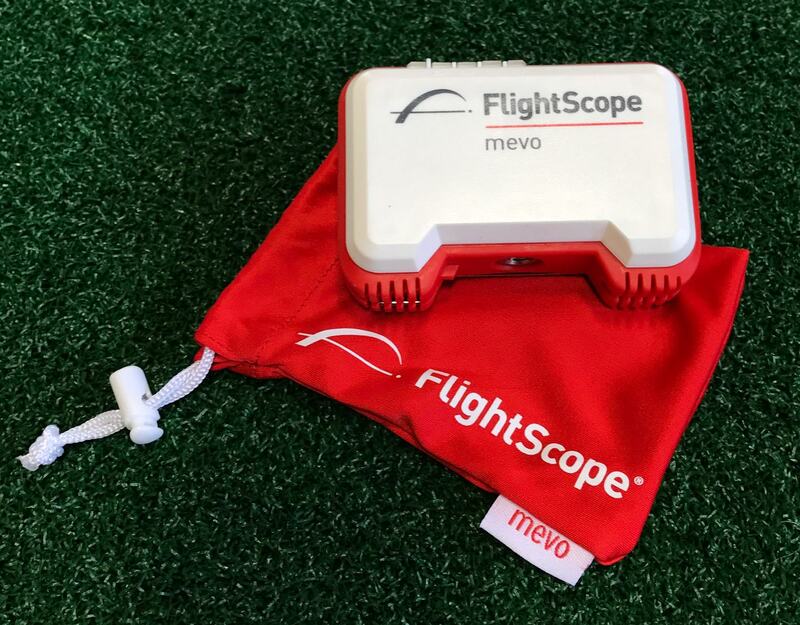 When you first launch the Mevo app, you’re asked to sign in to MyFlightScope.com, which is FlightScope’s online Cloud portal. 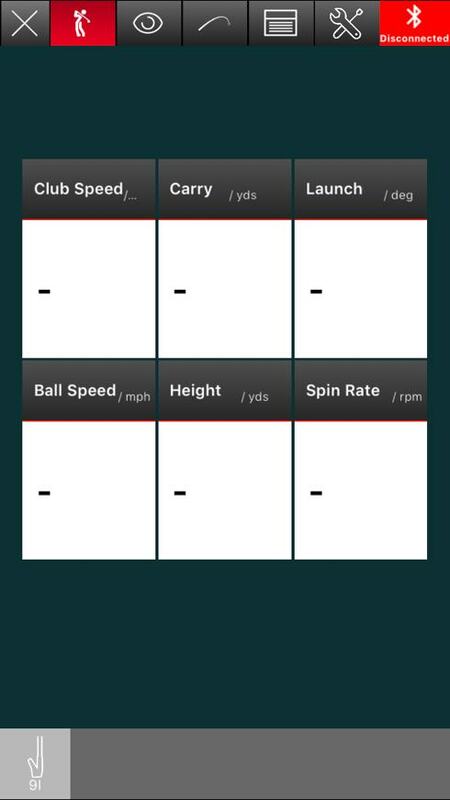 MyFlightScope.com allows users to view, store, and review each practice session synced from the app. 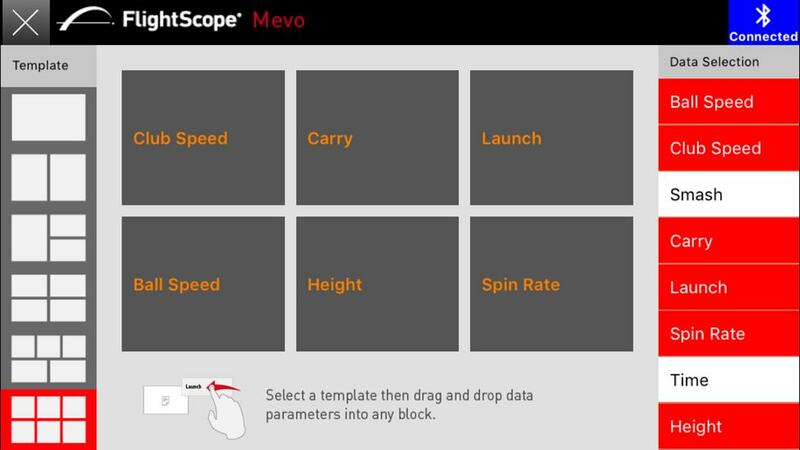 All FlightScope Mevo data parameters will always be available free of charge and only the videos require a subscription for online storage and viewing. FlightScope says that, coming soon, there will be various subscription packages available for every user. 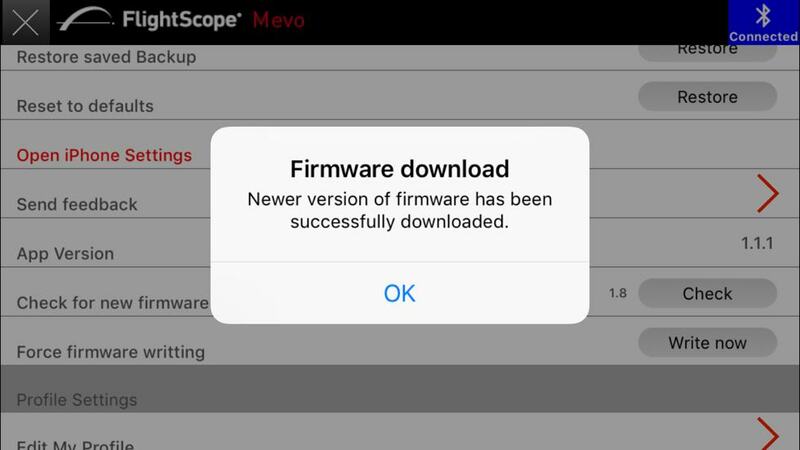 Finally, the Mevo software and firmware are both being updated continually. While writing this review, the Mevo gained the capability to work in portrait orientation, and it works wonderfully. 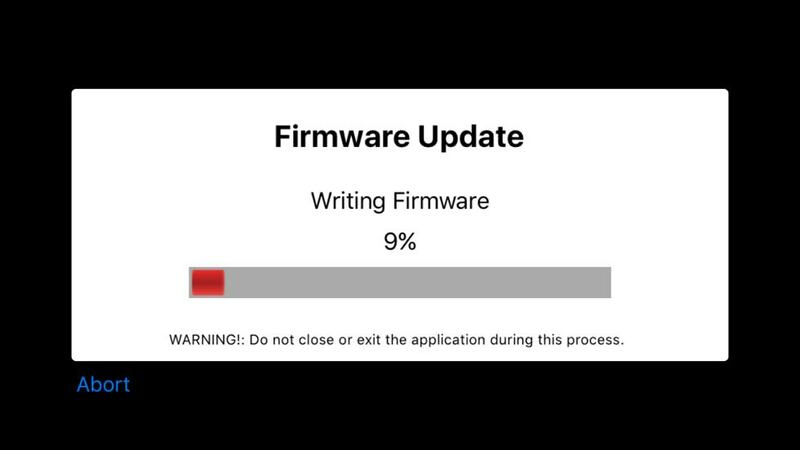 I’ve already updated the firmware on the Mevo unit itself a few times, each time improving the accuracy and capabilities of the device. The Mevo you buy now will get better over time. The Mevo software is continually being updated and improved. If you’re reading this review, the Mevo is for you. Golfers who just enjoy an occasional 18 holes to get out of the house and drink some beers with their buddies are not spending 15 minutes reading a review of a $499 personal launch monitor that fits in your pocket and cup holder. If you’re in need for a personal launch monitor — for dialing in your wedge distances, for optimizing your tee shots for launch, carry, and spin, for building clubhead speed, for practicing the quality of your strikes, for lowering (or raising) your iron launch angles, for nailing your short game yardages, or many other things — the Mevo is the best thing on the market. It blows away the $99 to $299 simple devices, and drastically under-cuts the $1500 to $2500 devices that give you only a little bit more data or integrate with some simulation software. The Mevo is accurate, compact, easy to use, and gets better with every software and firmware update. It costs less than some new drivers or a new set of irons, and makes a great birthday, Christmas, or “just because” sort of gift — for yourself or the other golfers in your life. 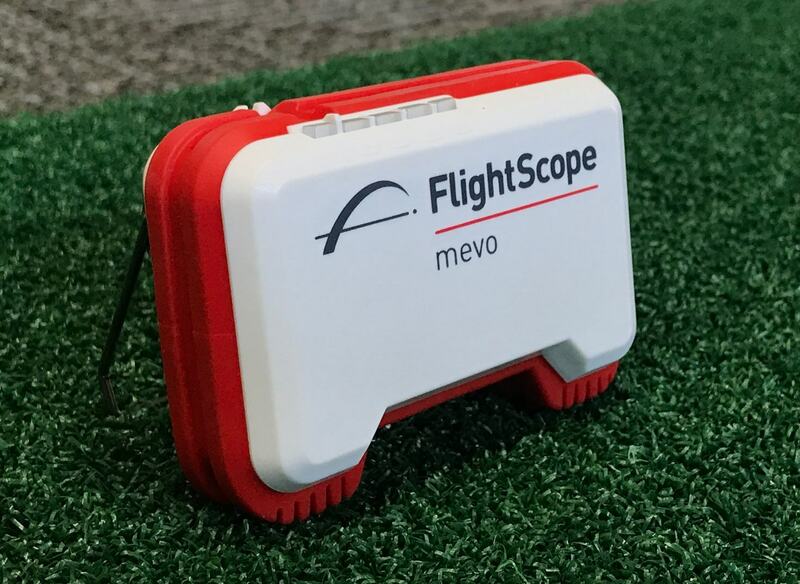 Multiple golfers in the same family can share a Mevo, and everyone can create their own account on MyFlightScope.com to keep their data to themselves. The Mevo is a winner, and got thumbs up from everyone who helped me test it. Great review. This device deserves serious consideration. My initial thought was it would help during winter practice. After reading this and watching the video, it seems like something that could/should be used throughout the year. I suppose an important consideration is whether the data will help towards improvement or if it’s something that will simply make practice more interesting. What are the stats on the camera ? Frames per second ? Shutter speed ? Sunk, the Mevo does not have a camera. The “stats” are whatever camera (your iPhone, for example) you use to record the video. Great review and very interesting product. 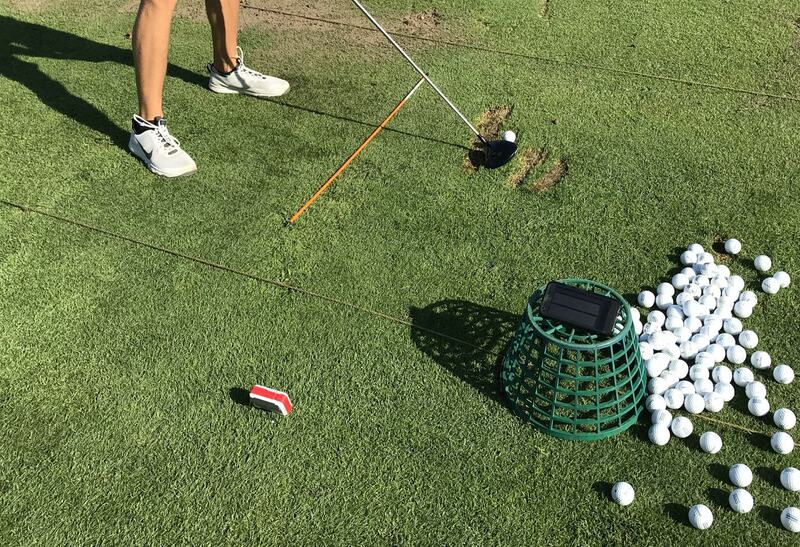 There are so many gadgets out there but this looks like it could help with consistency and distance control. Anything that makes practice more interesting can only help. I feel like this is a really cool product that I would love to own but it still has too steep of a price in my opinion. I practice a ton on the range and I am super concerned about my numbers but it’s easy to shoot a range flag with a rangefinder and know how far you’re hitting it. Spin numbers are great while you get fitted but the end results on the course are more important and more of a reality. Take those $500 and play 10 rounds for the same price, you should know what your distances are pretty well from that. Can it be used with a nerf type ball ? would like to be able to use it in the living room with out sending golf balls through the wall. I don’t see the usefulness If it has to be used while hitting real golf balls outside at the range, (I can see ball flight then). No, sixshooter, it cannot. It needs accurate spin, speed, etc. information. I mean, I suppose it may give you SOME information (then again the foam may do too much to absorb the radar, so it may not), but it wouldn’t be “correct” at all. It’s useful because it can give you accurate information, even if you’re not at a range. Plenty of people are using the Mevo indoors, hitting a ball into a net. If you use the Mevo at an outdoor range and the balls do not have dots on them does that adversely affect the distance and speed data, or is it still accurate? Without metallic dots, no data? You still get all the data, @Tsletten. It just may not be quite as accurate. The longer the flight, the better chance of good accuracy without dots. But even indoors, it works surprisingly well without dots. I love tech like this but it does worry me that beginners and mid-handicappers will reply on these tools rather than seek proffesional advice. I wonder how much better a new player would be after spending $500 on this compared to spending $500 on lessons? Just playing devils advocate. Good in-depth review though. Good work.